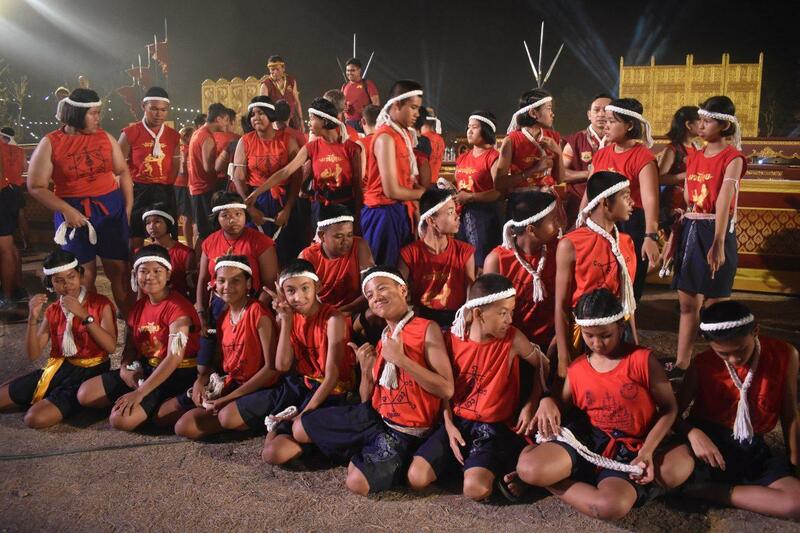 The Wai Kru Muay Thai Ceremony 2019 was held at Wat Langkhakhao in the ancient city of Ayutthaya, March 16th-17th. 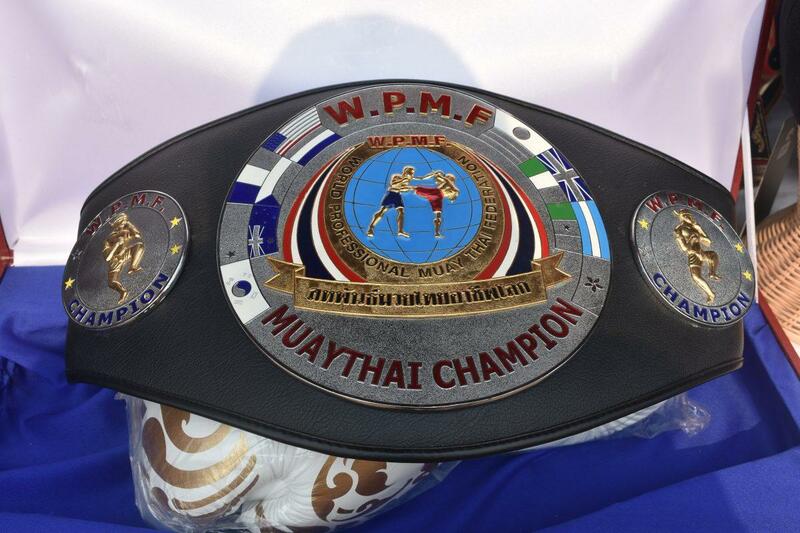 It’s an annual event where Muay Thai boxers from around the world gather to pay respect to their teachers. 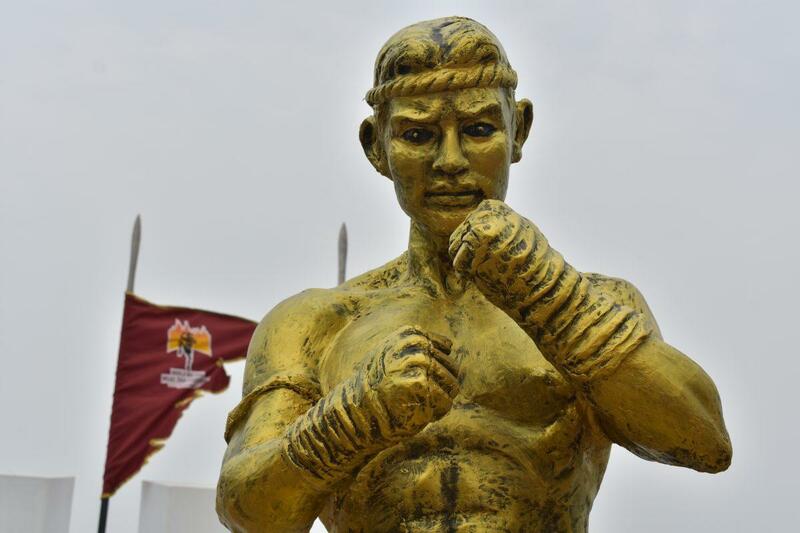 The event is also a time to pay homage to Nai Khanom Tom, a legendary Muay Thai warrior hero. He was captured by the Burmese during one of the many wars between the two countries in 1774. 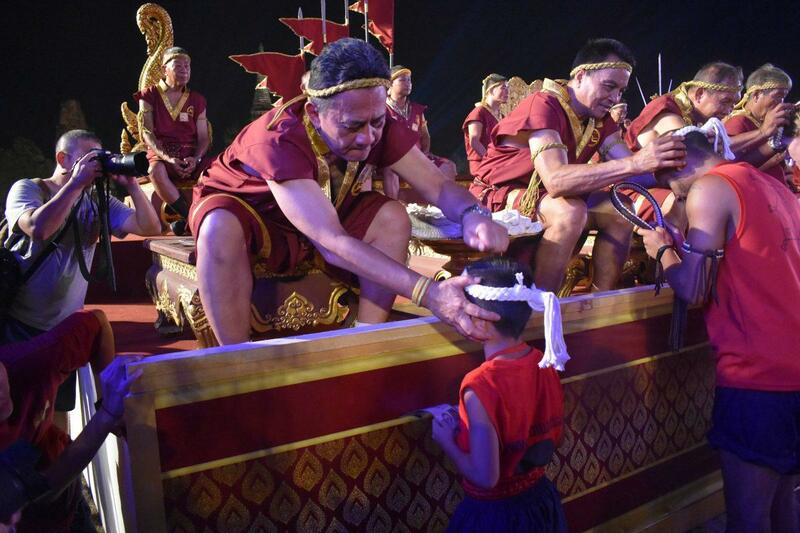 The Burmese offered him his freedom if he could defeat a Burmese boxer in gladiator-style combat. 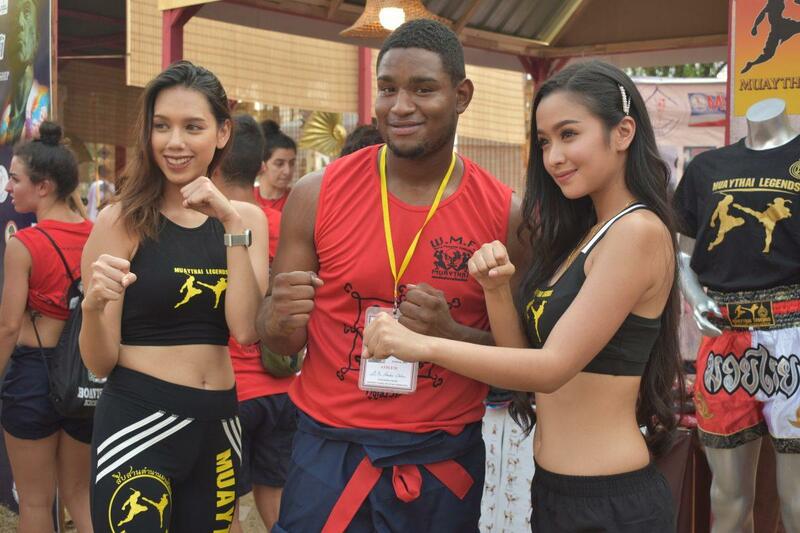 He duly defeated his opponent using Muay Thai style fighting techniques. Tom was then forced to take on another nine fighters who he also defeated, winning his freedom and that of all the other Siamese prisoners. 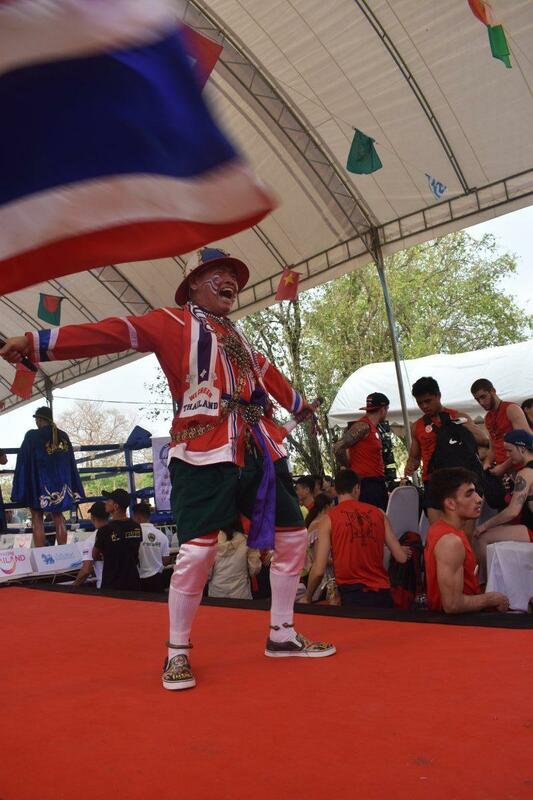 He is regarded as the “father” of Muay Thai. His statue stands at the entrance to the arena where the ceremony takes place. 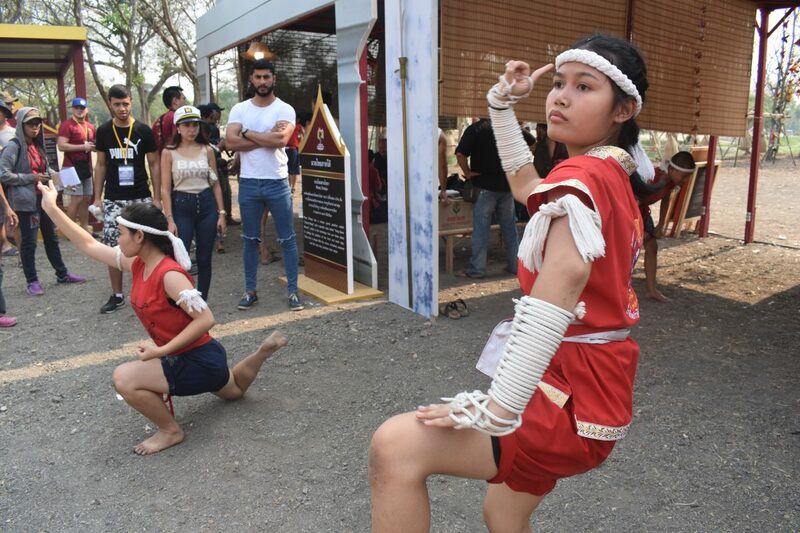 The event featured demonstrations of traditional Thai crafts associated with Muay Thai, Yantra writing & tattooing, Aranyik swords making, & hand binding. 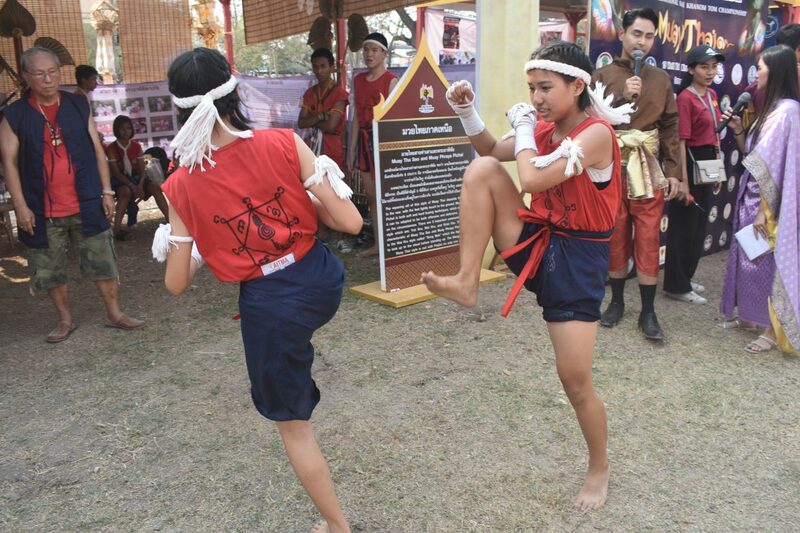 There were also demonstrations of Muay Thai fighting techniques, boxing drills, and sword fighting. The Yantra writing contains symbols written in Sanskrit. 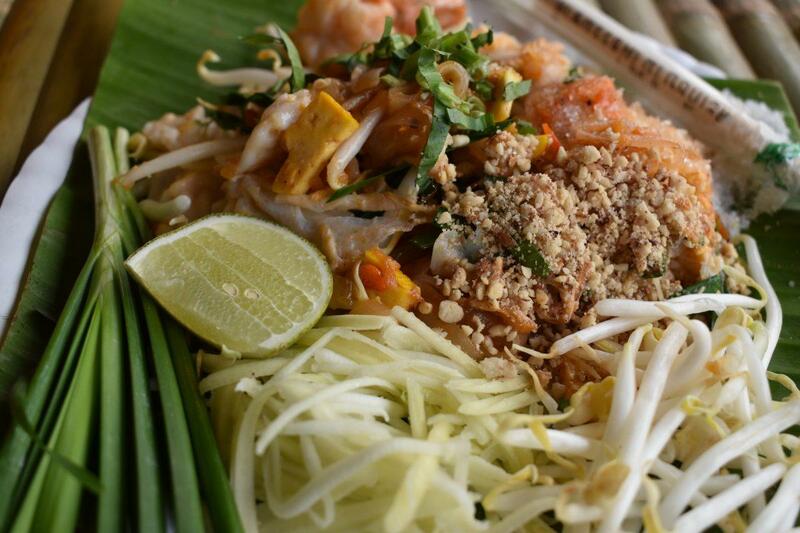 They represent magic powers that are believed to protect & bring good luck to the owner. This belief is widely shared and taken very seriously in Thailand. 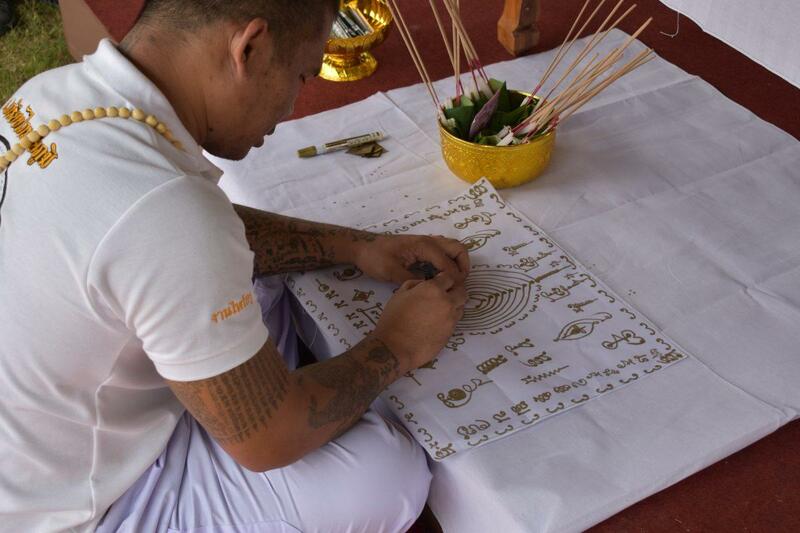 The yantra can be drawn on cloth or as a body tattoo known as a Sak Yant. 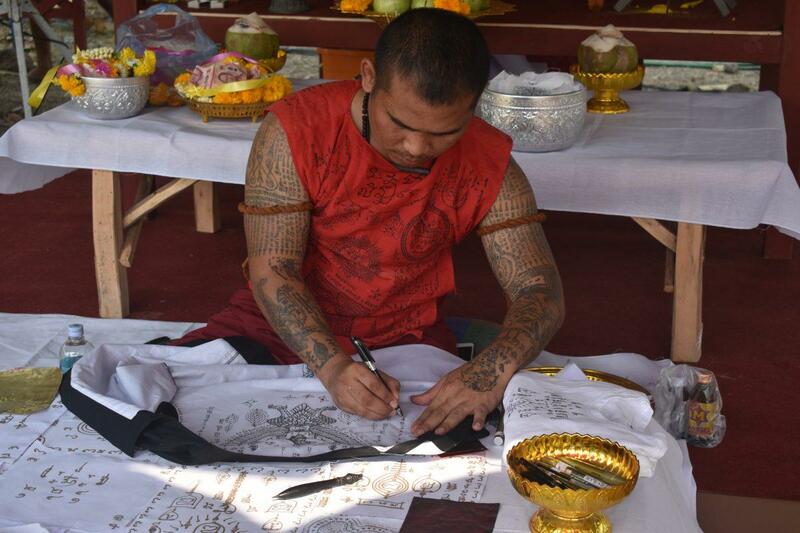 Sak Yant tattoos are deeply rooted in the Buddhist religion. 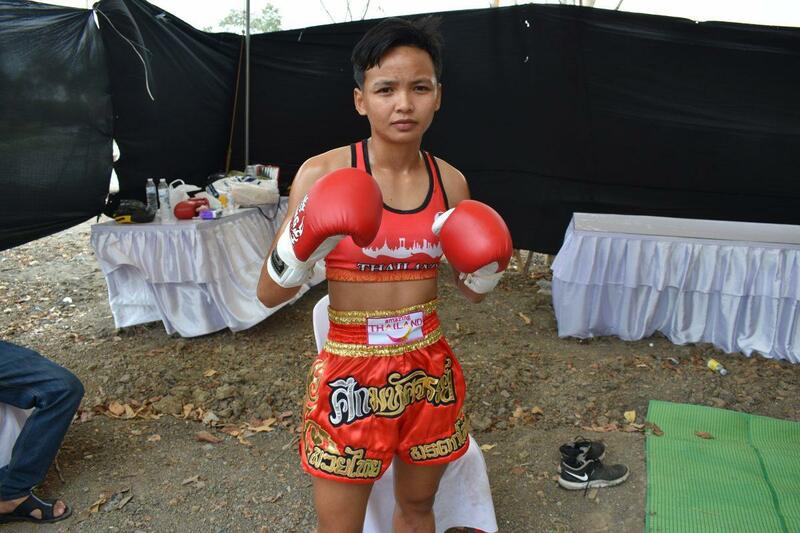 In Muay Thai boxers they inspire power, strength, fearlessness, protection & confidence. Getting a Yak Sant tattoo was one of the most popular activities over the weekend with a queue for the services of the tattoo masters. 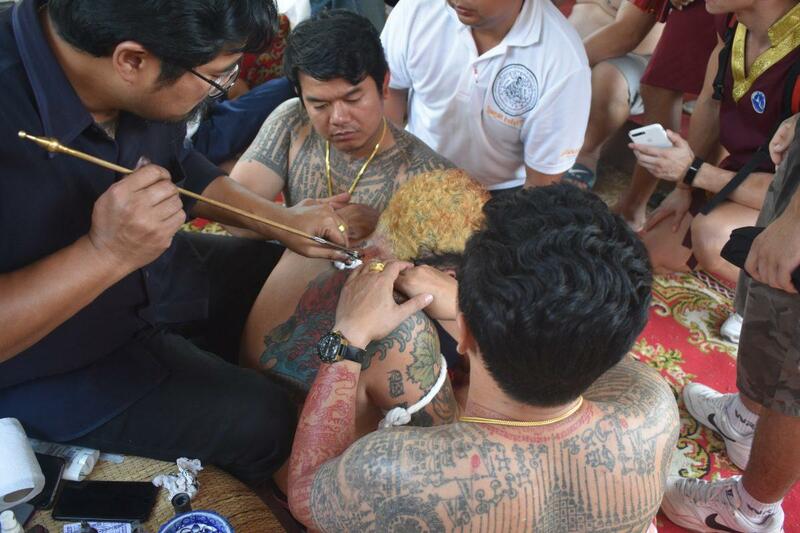 The tattoos are applied with bamboo needles and it seemed to be slightly painful by the looks on some of the recipient’s faces. 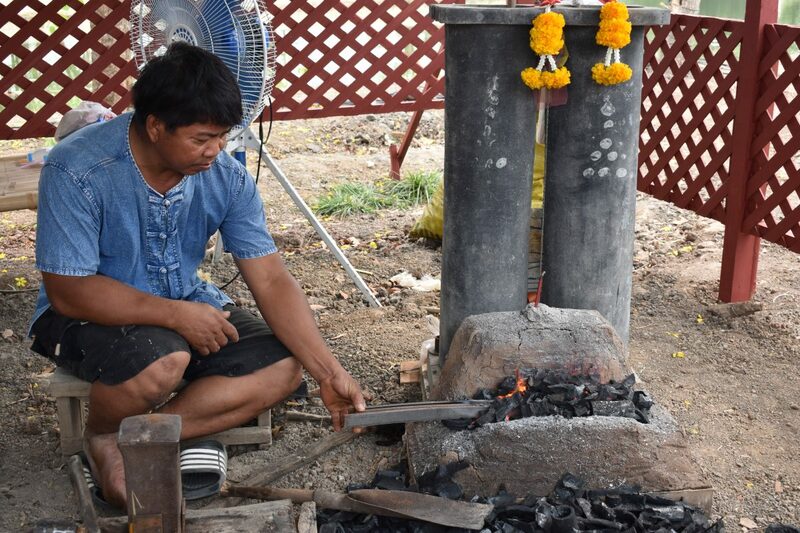 In more ancient times swords were an important weapon for Thailands warriors. 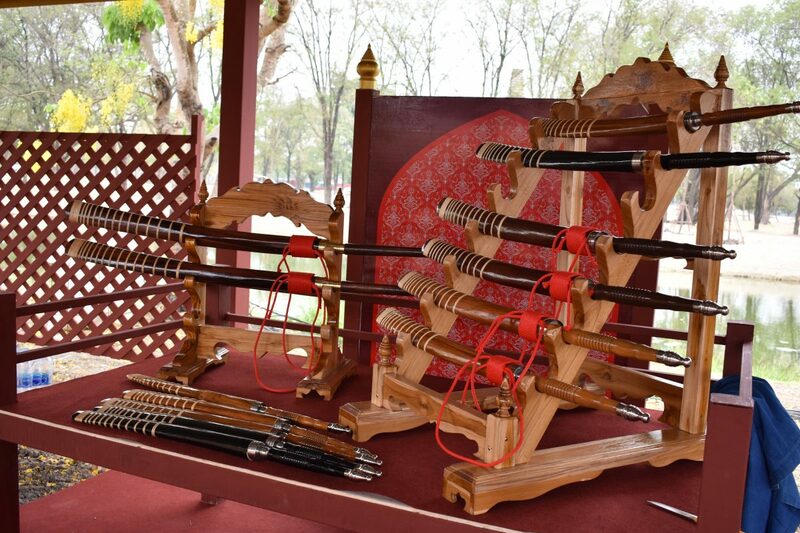 There were a variety of swords and daggers on sale going from 1500 to 3500 baht. 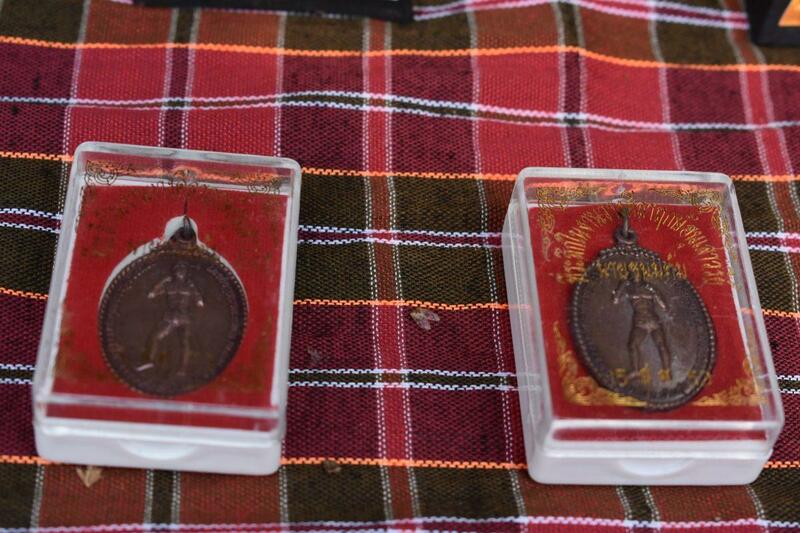 The weapons were engraved with yantra writings. There were sword fighting demonstrations and a live sword making demonstration showing the steps and processes of sword forging. 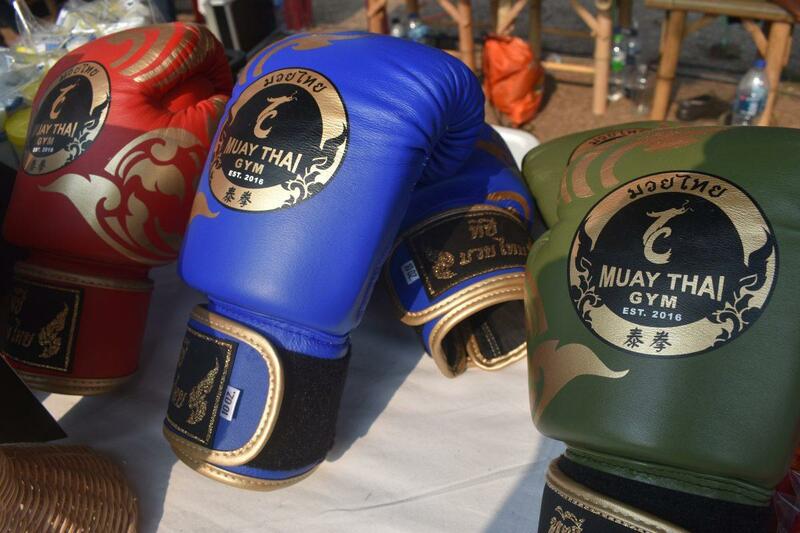 In the past before the use of boxing gloves Muay Thai fighters used a traditional hand binding made from a special string. 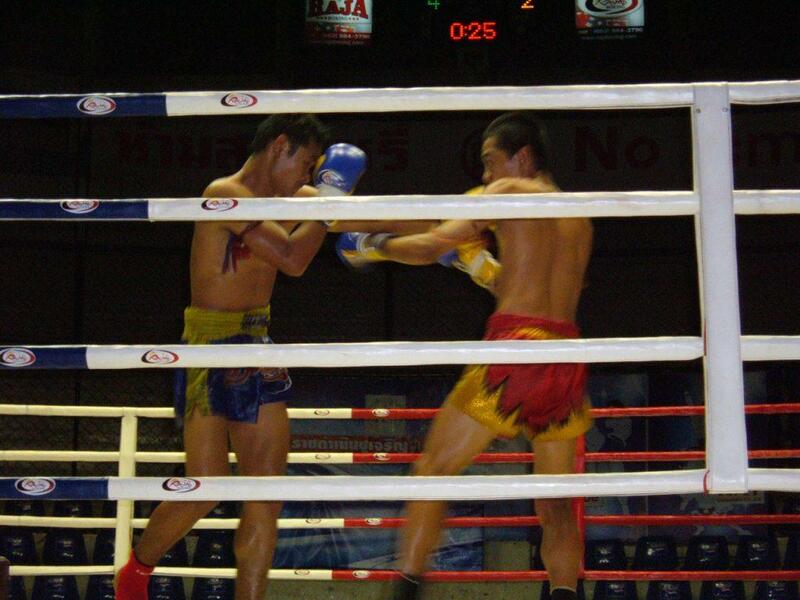 The process is called Kard-Chuek and strengthens a boxers punch. This is still used today under the glove. 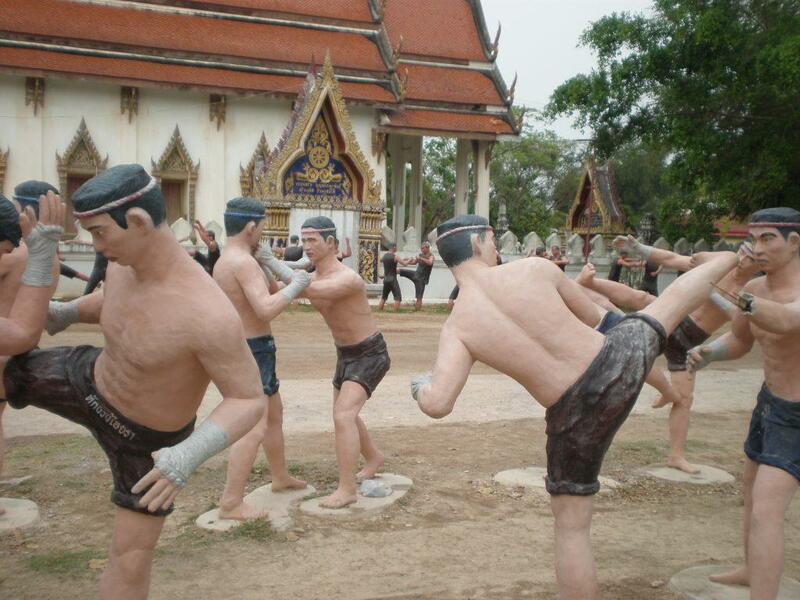 In Thailand, there are several regional variations of Muay Thai. 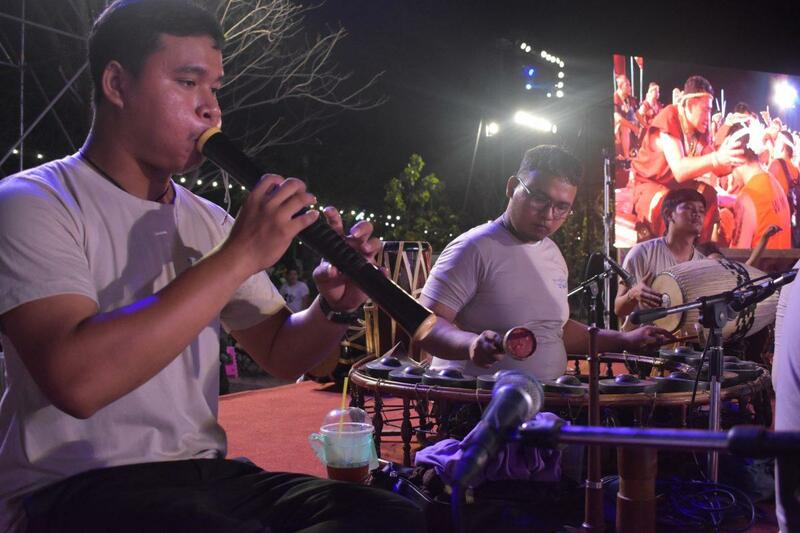 At Wai Kru 2019 there were performances of the different types. 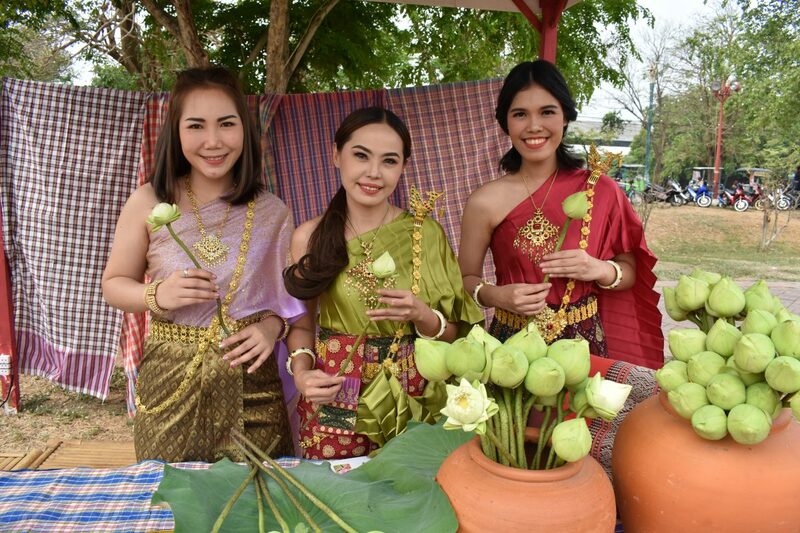 They are Muay Tha Sao (North), Muay Korat (North East), Muay Chaiya (South), Muay Lopburi & Muay Pra Nakhon (Central). Muay Thai students from each region displayed their different techniques & Ram Muay ritual dances. 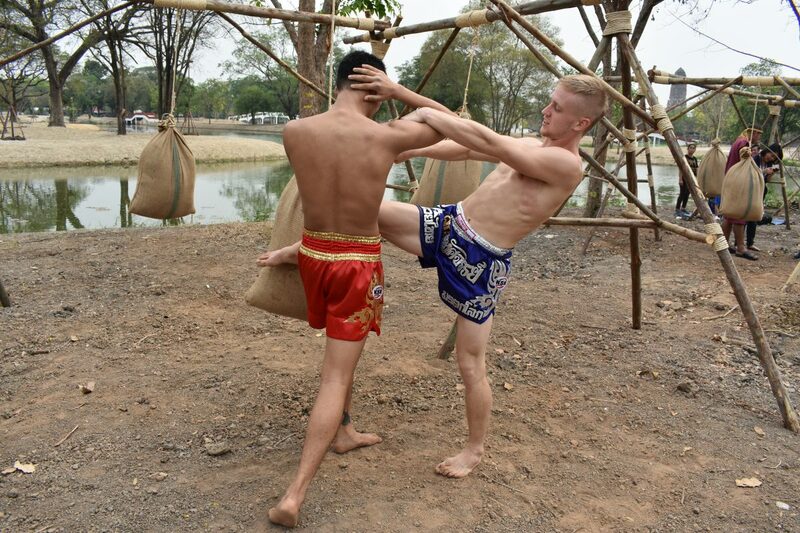 There were also general displays of Muay Thai techniques that popped up around the sight. 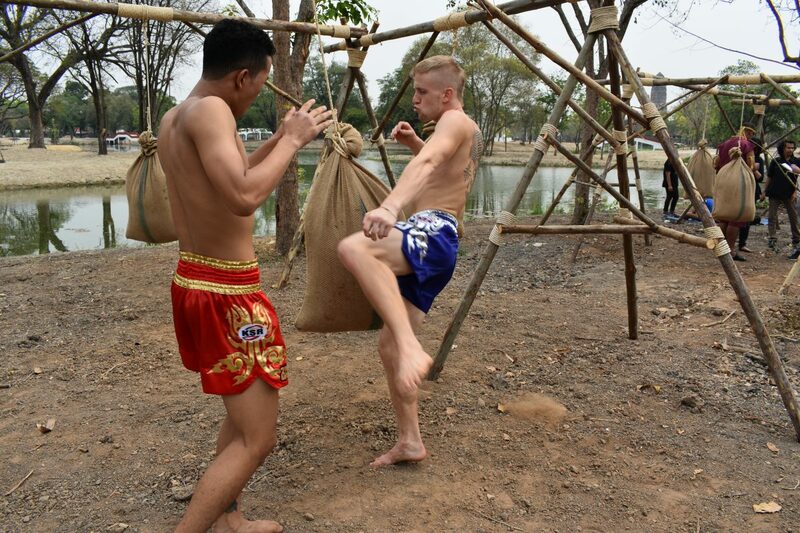 The techniques displayed showed the eight weapons of Muay Thai, fists, elbows, knees & feet as well as some master tricks. 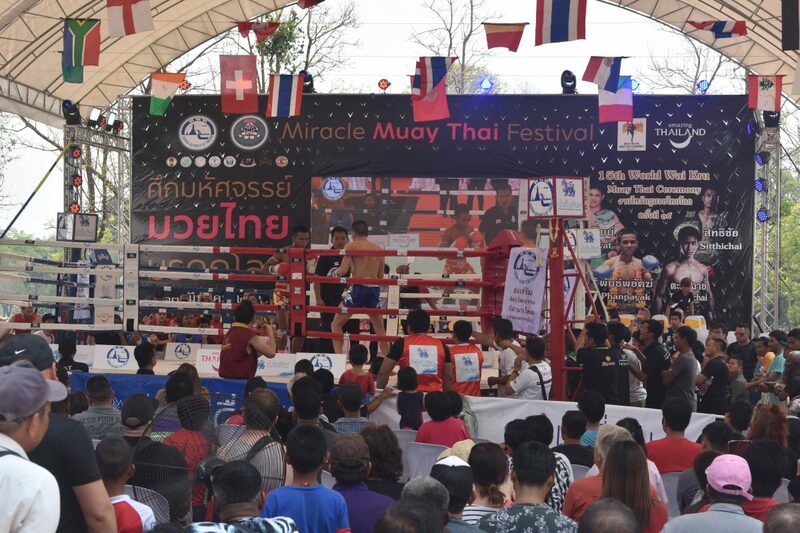 There was also a market area selling Muay Thai equipment & souvenirs such as gloves, shorts, t-shirts, mongkols, & pradjiads, Also, a food market selling tasty Thai food. 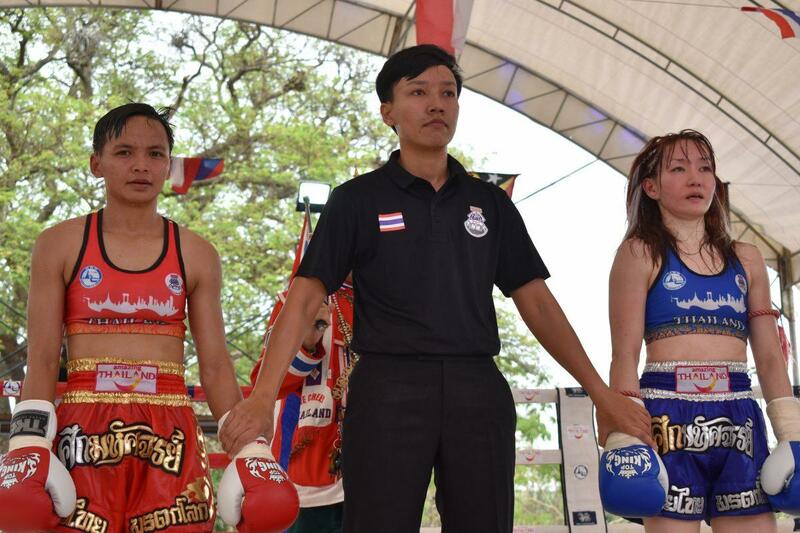 The highlight of the event apart from the ceremony were the boxing bouts which included several exciting world title bouts. 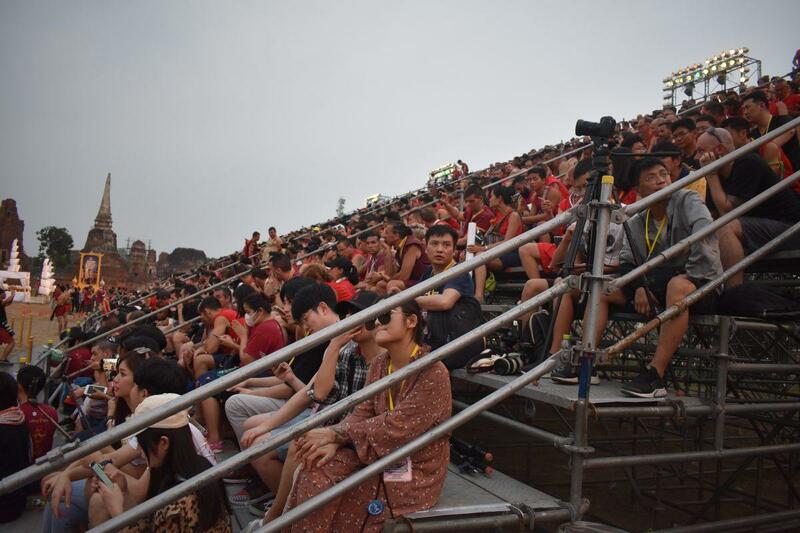 The ring, surrounded by plastic chairs drew a big crowd to witness the top Muay Thai fighters in action. 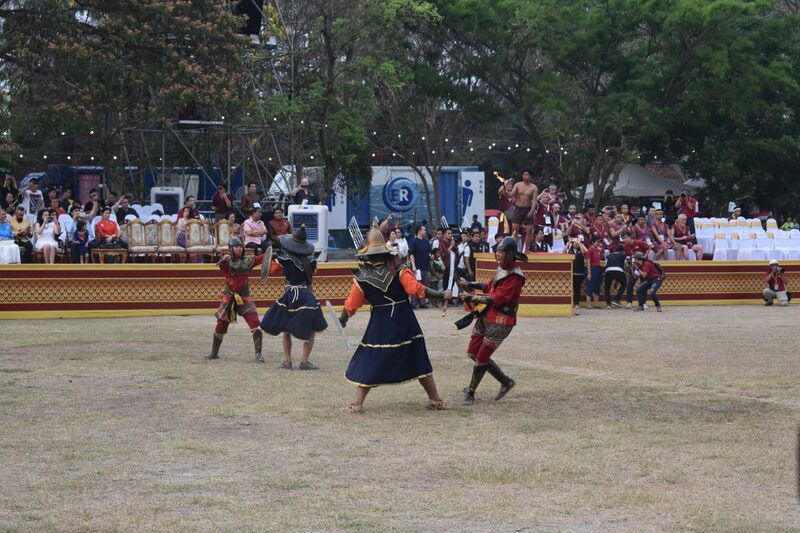 The fighting was fast & intense and getting a close-up view made you appreciate the skills of the fighters. All of the fighters showed respect for their opponent, win or lose. 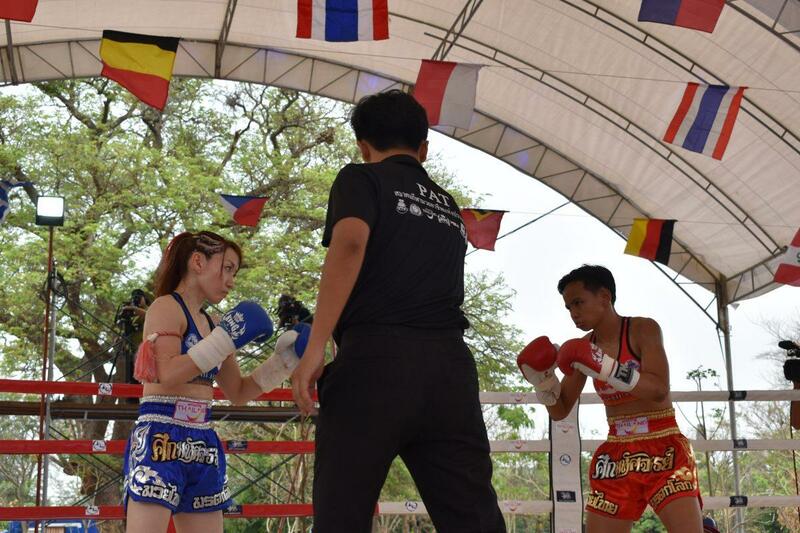 On the first day, one of the most exciting title fights was between Kularbdam from Thailand & AI from Japan. Both fighters weighed in at 105 pounds. Before the bout, both fighters sat silently mentally preparing themselves for the fight. The five rounds of fighting were intense and passionate with both fighters giving their all. At the final bell, it was difficult to work out who the winner would be. 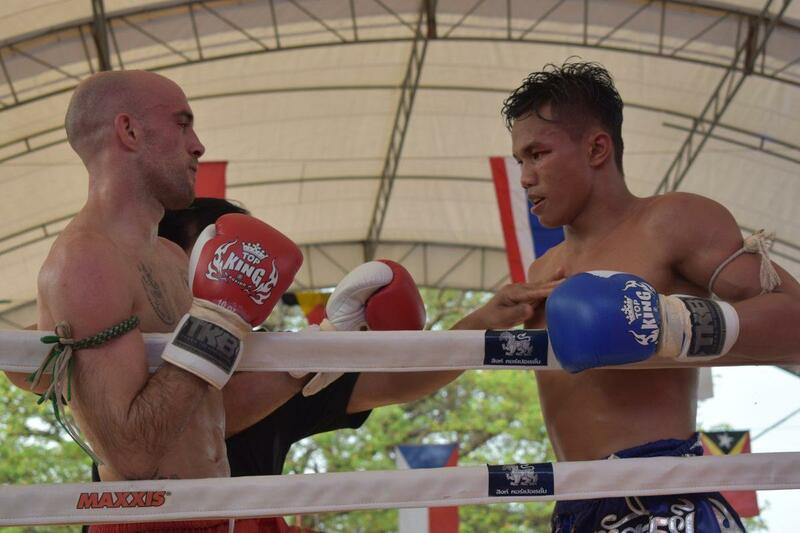 The headline fight on the second day was the bout between Carlos from Spain & Pongpat from Thailand. 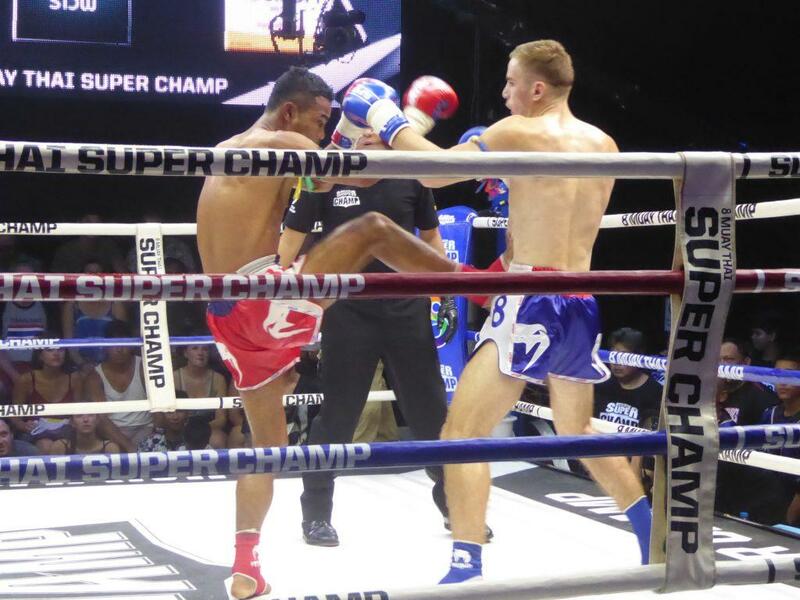 Pongpat defeated Carlos on points with some skillful fighting using his feet and shins to good effect despite taking a few heavy punches to the face. 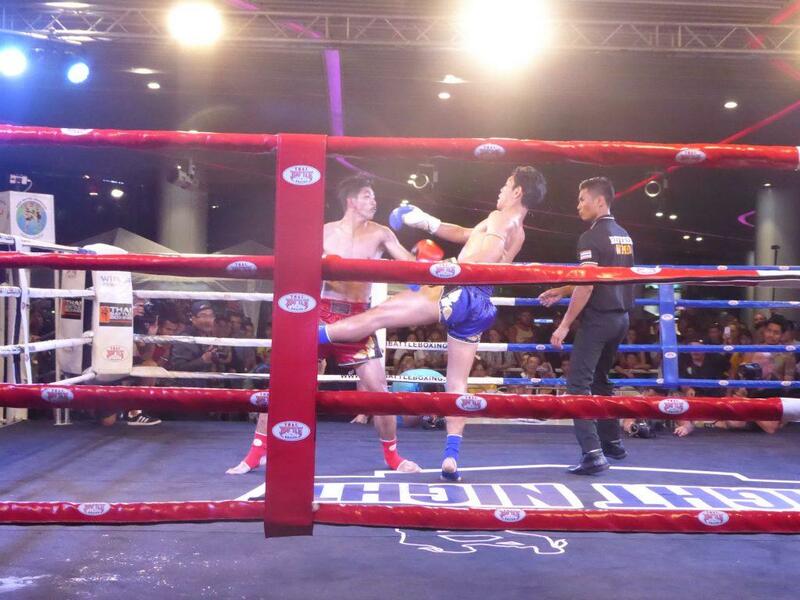 After the fight, both fighters showed their mutual respect by kneeling to wai each other. This summed up the spirit of the event and the fighting. 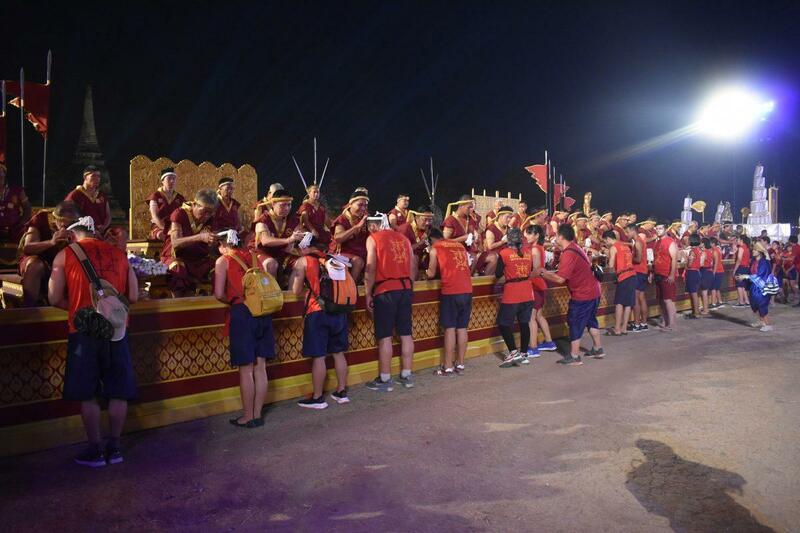 After the conclusion of the boxing, everybody moved towards the arena for the ceremony. 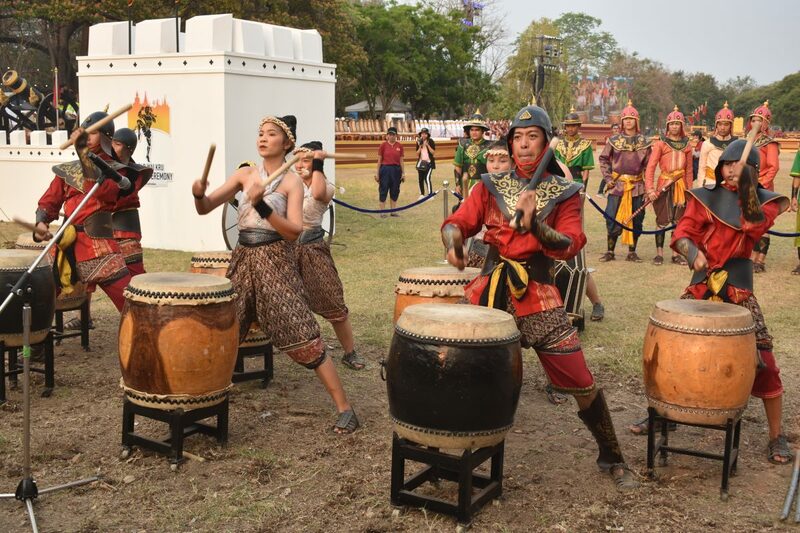 The ceremony started with an amazing display of battle drumming. 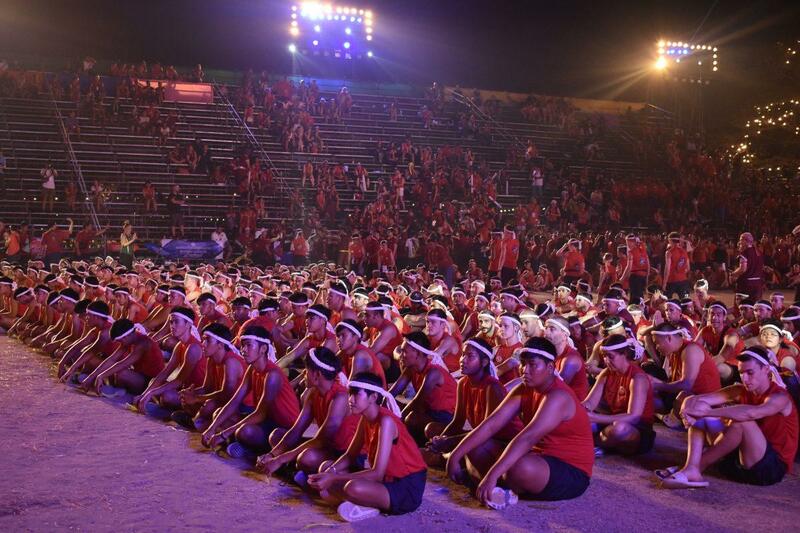 After the drums, hundreds of Muay Thai fighters dressed in red entered the arena to take their seats. 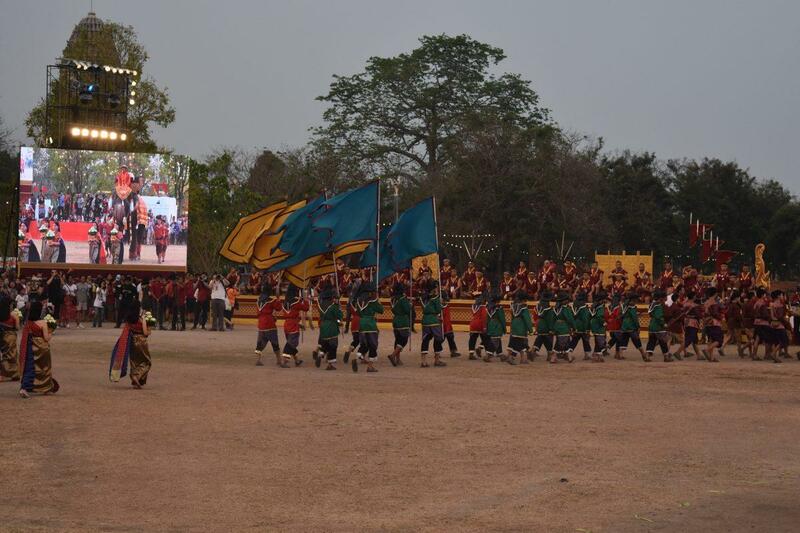 The ceremony continued with a march into the arena of the Muay Thai Masters who took their seats on a high stage. 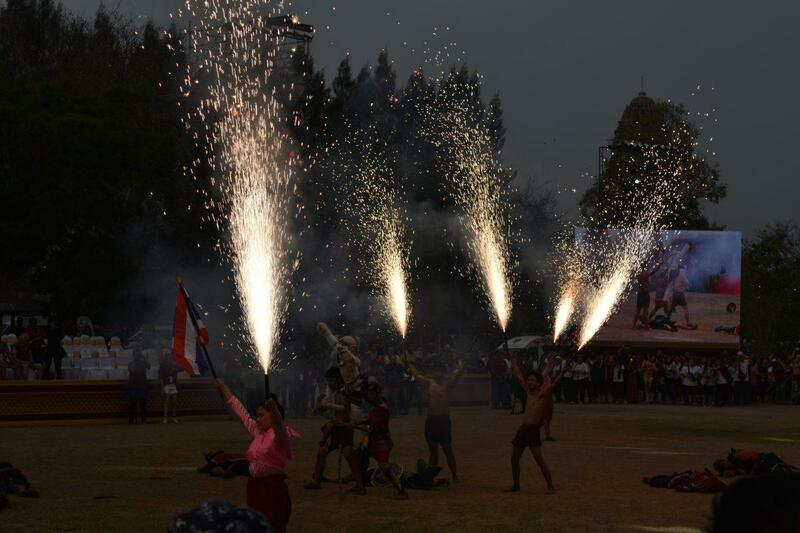 The cultural show continued with a recreation of a battle scene featuring Thai soldiers defeating the Burmese invaders. 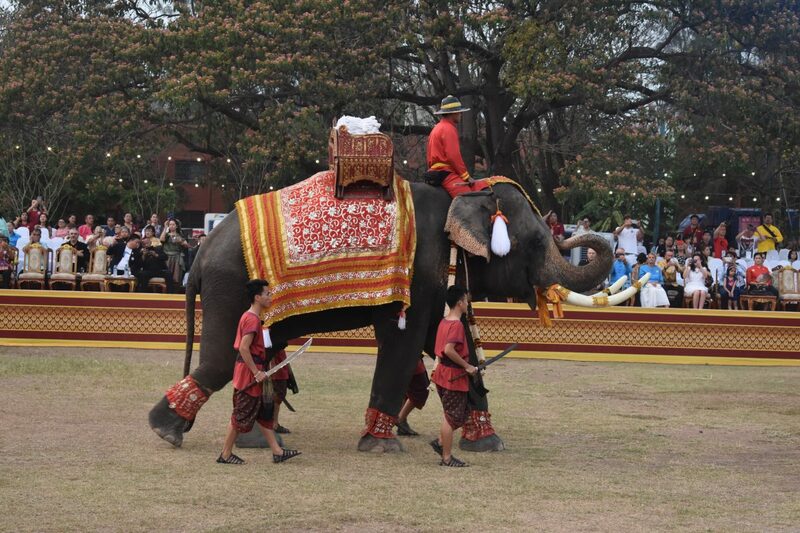 Soldiers dressed in period uniforms accompanied by war elephants followed. 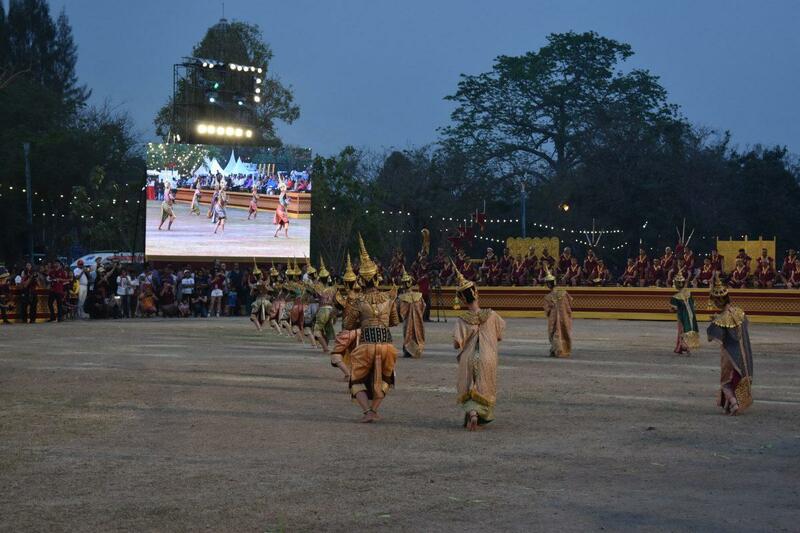 The show finished with a beautiful traditional Thai dance show performed by an elegantly dressed troupe of performers. Finally, the big moment for the fighters arrived. Time for the Wai Kru Muay Thai Ceremony to begin. The fighters walked to the stage where the Muay Thai Masters were waiting. 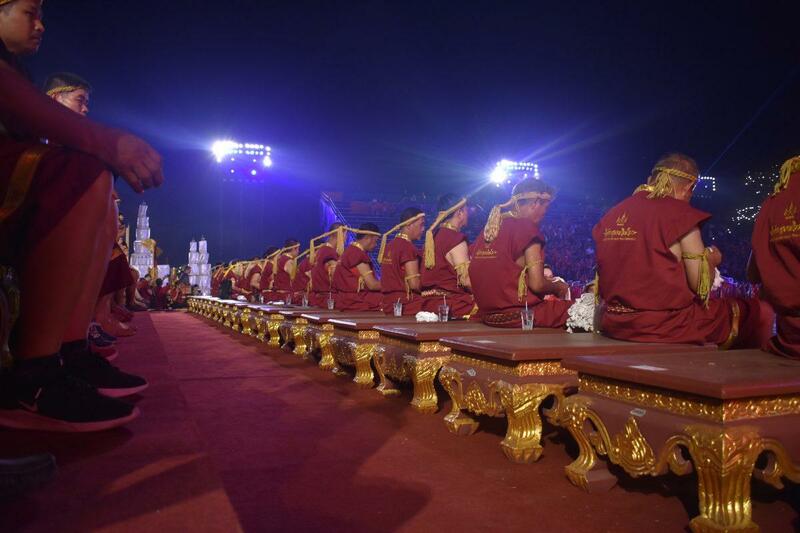 Each fighter received a white Mongkol, placed on their head and a blessing from the master. In return, the fighter gave three wai’s to the master to show respect. 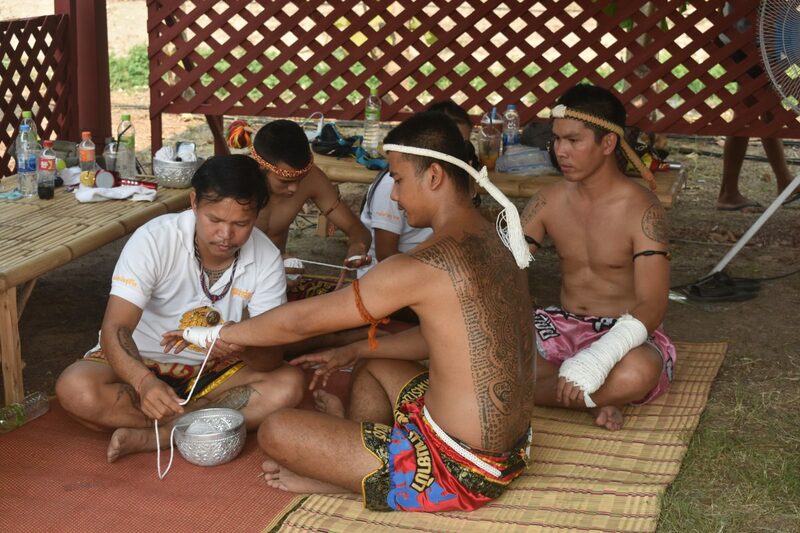 The climax of the ceremony is the communal Ram Muay, where all the fighters perform a sacred ritual dance to honor the masters. 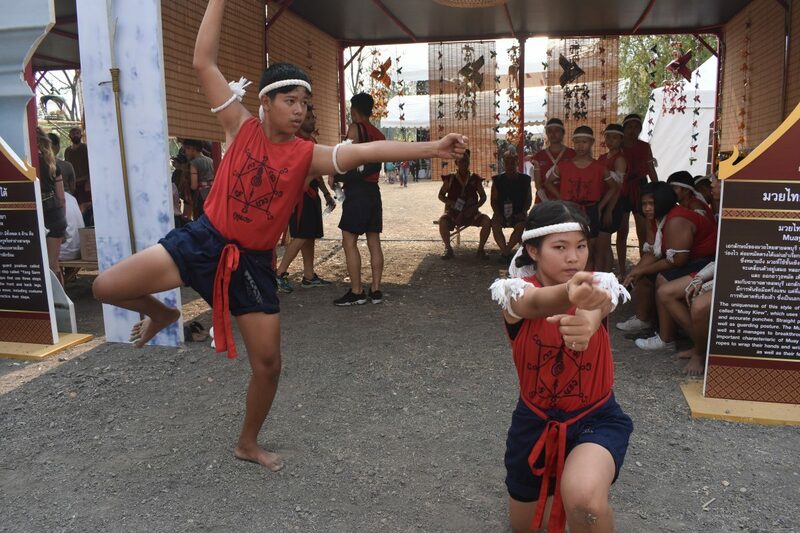 The basic meaning of the Wai Kru Ram Muay is “a war dance saluting the teacher”. 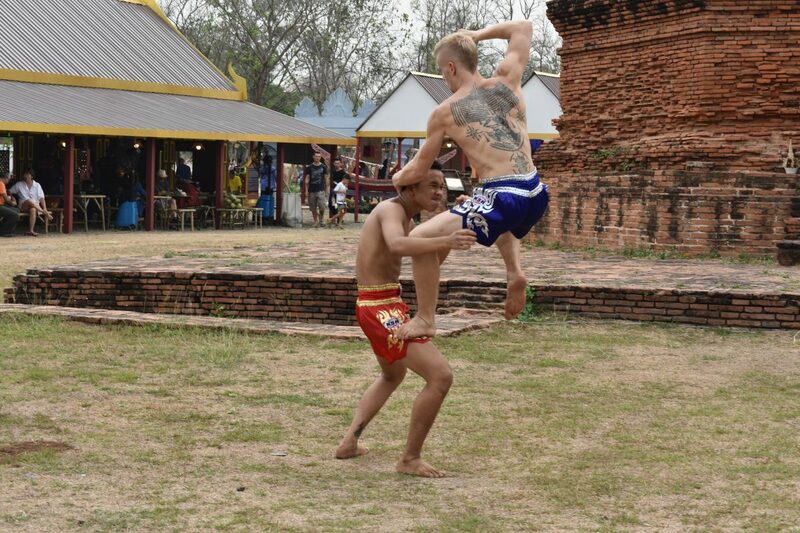 Famous Muay Thai fighters led the Ram Muay perched on platforms on all four sides of the fighters. 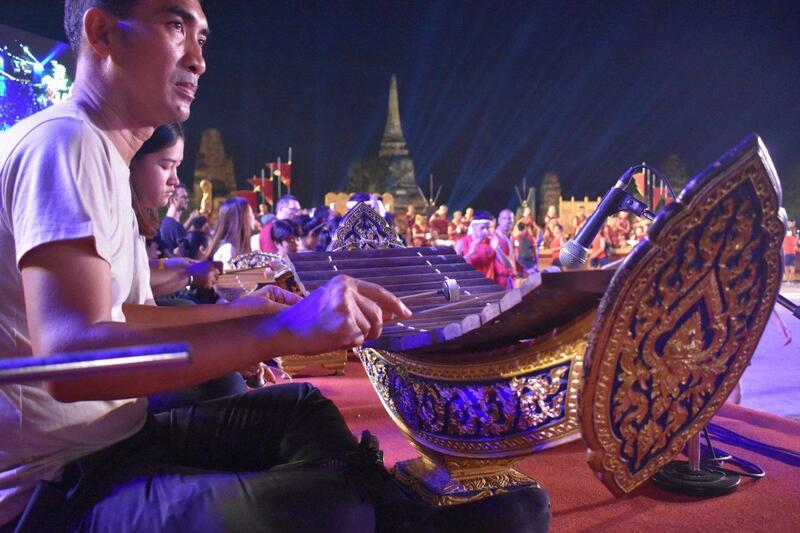 The dance is performed to a beautiful soundtrack performed by a troupe of musicians playing traditional Thai instruments. 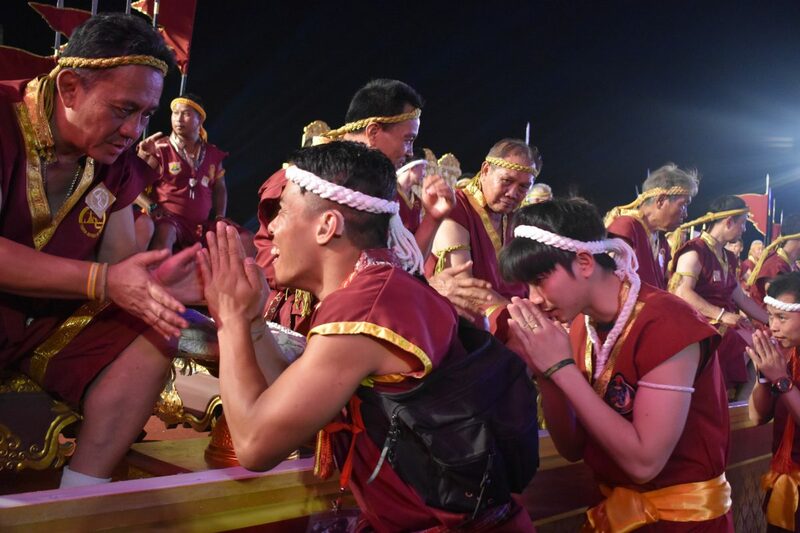 Muay Thai Practitioners from all around the world traveled to Ayutthaya to take part in the Wai Kru Muay Thai Ceremony 2019. 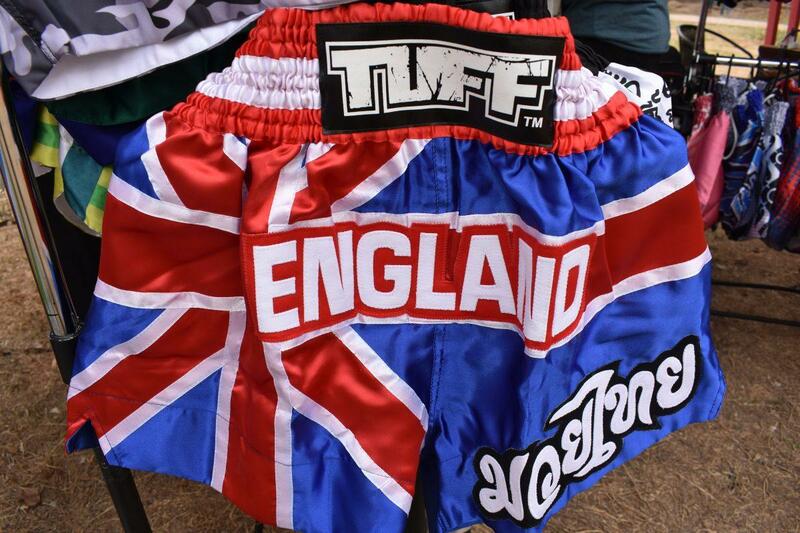 It was great to see so many different nationalities coming together to share their love of Muay Thai. This also applied to the boxing with many foreign fighters challenging the Thai fighters on their home turf. 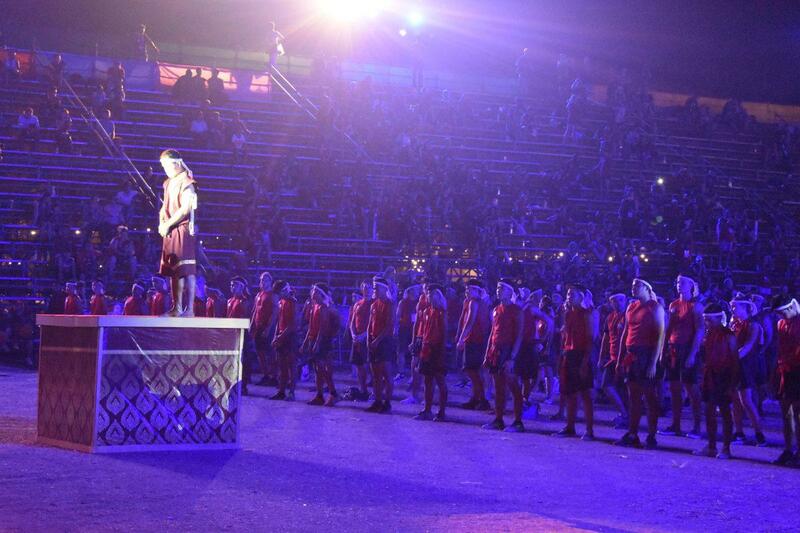 Seeing this event was a worthwhile experience, and I gained a greater understanding of the sport and its traditions. I’ll be back next year!